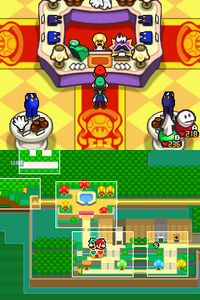 Toadles Boutique is one of three equipment stores located in Toad Town Mall in Mario & Luigi: Bowser's Inside Story. Among the three other stores, it sells mid-range equipment. Aside from its main function as a store, it also appears in a sidequest in which the Mario Bros. must find a Toad in the store while playing hide and seek. The Mario Bros. may only shop here after achieving the Shine Rank. Otherwise, the distinguished Toad will impolitely ask Mario and Luigi to leave. Hero Wear 1500 coins Increases defense by 60. Balm Wear 2000 coins Increases defense by 90. SP Socks 500 coins Increases SP by 20%. Special Socks 600 coins Recovers SP once per turn. Heavy Gloves 500 coins Increases solo hammer attacks' power by 20%. Item Gloves 600 coins Causes items to be obtained when the hammer is used. Heavy Boots 600 coins Increases solo jump attacks' power by 20%. Siphon Boots 1000 coins Recovers 5% HP after a jump attack. Happy Charm 500 coins Increases the likelihood of a lucky hit by 1.5x. Budget Charm 1500 coins Decreases wearer's SP consumption by 30%. Butikku Kinoda Boutique Kinoda. "Kinoda" is a pun on kinoko, meaning "mushroom". This page was last edited on February 25, 2018, at 16:40.